Since my plane didn’t leave until 6 p.m. on Monday I ended up asking for some materials on our U.S. metric system history be collected from their storage location and delivered to the Adams building so I could take a look at them. • The library gets two deliveries a day, one in the late morning and another in the afternoon (that was going to be too late for me). My great appreciation to those folks who helped me get the materials in the morning delivery. • When you submit the electronic request (the only way you can get materials from off-site) you get an email notifying you the request for the publication has been received, another when it has left the storage facility and another when it arrives at your specified delivery location. When I arrived, I was thrilled to see so much material and set about going through it and noting in which of three “bins” the items should reside: not useful for my purposes, ask my library to acquire so I could spend more time with them and, finally, seek to acquire for my collection. 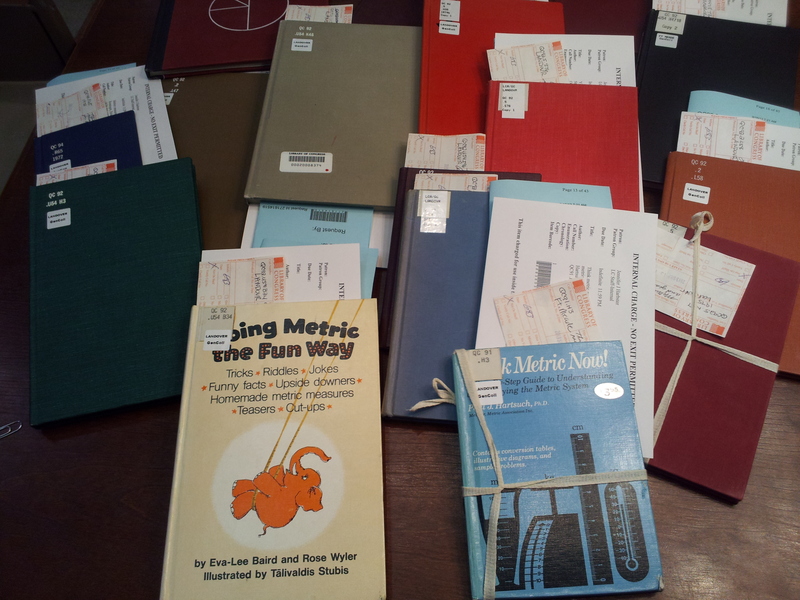 As I went through the books, some of which were self-published in an attempt to jump on the metric adoption bandwagon back in the 1970s, one thing that struck me was the excitement the authors had over the notion that the U.S. was finally adopting the metric system. For the past thirty years I have worked as a dietitian or nutritionist and have been amazed and appalled at the lack of knowledge of measurements of most people. Then I realized that our standard system of measurement is really a mish-mash of archaic terms based on parts of the human body. This year, 1975, will undoubtedly be the year that Congress will pass metric legislation. Well, she was right about the legislation passing. Too bad it was too weak to really have propelled us forward and another 30 years later we’re still buying things in pounds, yards and gallons. Upon arriving home, I began looking for the publications I wanted to buy and since I had done most of my primary research almost a year ago, I did a cursory search on the term “metric system” on Amazon. 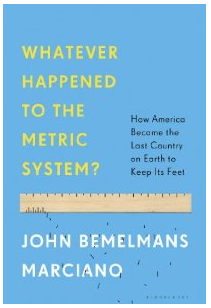 To my shock, I came across a yet-to-be-published book titled: Whatever Happened to the Metric System: How America Became the Last County on Earth to Keep Its Feet. The publication date is listed as May 27, 2014 and the author is John Bemelmans Marciano. While Amazon lists him as the author and illustrator of quite of few the children’s books in the Madeline series, he has also written Anonyponymous: The Forgotten People Behind Everyday Words and Toponymity: An Atlas of Words. I have a call in to his publisher since I couldn’t find any other straightforward way to contact him. I’m very interested in what prompted him to work on this subject as well as what it might contain. While I could research on this topic endlessly, what I’m most interested in is enough and correct information to inform the script for my documentary. Due to my communications/research background, I even have an information gathering philosophy: I don’t need to see everything that was ever produced on my subject but enough so, as new information on the subject might come to light, nothing contradicts what I’ve asserted and hopefully only supports or expands upon it. My many thanks to Jennifer Harbster with the Library of Congress for taking the time to submit my blog for consideration. I truly appreciated her helping me with these efforts in multiple ways. I will continue to do everything I can to make this blog interesting and useful.